"Falling loops"? Are we talking about on the fingers or other places in the hand? I haven't heard of this. When I look at fingerprints, I am sometimes looking to see which quadrant of the finger they sit in because that can tell me something. For example, I have a client with 10 loops who has them all sitting in the 'family zone' quadrant of the top phalange on all her fingers. So her Life Purpose is very focused on family relationships mattering the most. The picture below represents Ed Campbell's interpretation of Dukes' "falling loop", both his illustration and Dukes' illustration display 2 TWO LOOPS. "Falling loops represent dualism in approach to experiences. Though highly perceptive, without stabilization in other features of the hand, this is an erratic sign." But I think the 'falling loop' can also manifest as just one loop with a configuration likewise to Campbell's upper loop: see the center picture below (though this example also has a small 'triradius' below the upward bending point of the loop... which could be described as a third variant of the 'falling loop'!). Which of these three variants do you observe on that hand? hi Sue, I was taught that a falling loop - (it looks like a wave rising high then crashing down) can bring experiences in life such as - just when they feel they are achieving something, it all comes crashing down. They need a lot of determination to start again & see things through, so look for compensating features eg a strong thumb. That's if only the loop as in middle example on Martijn's last picture. If it's like the one Ed shows, that will bring in the duality of the double loop, highs and lows, ups and downs, hence the erratic nature that Dukes was talking about. Thanks for sending me the print of a family member as an example. But I noticed that the print has 3 'double loops' - which are far less unusual as 'falling loops'. Though, I can understand that you associated them with Ed Campell's example. But if you take a closer look at Ed's example, then you will see that there is a 'triradius' (triradial point) visible BETWEEN the two loops. While in you family member's fingerprints, there are only two normal triradii visible - that are always featured with a 'double loop'. Do you now see the difference as well? PS. Ed described this at this website with a rather 'cryptic comment', describing a combination of water- and fire elements - which he probably relates the the presence of 2 independent 'loops' (one normal 'loop' plus one 'falling loop') + a 'tented arch'... though formally, there are 2 loops each featured with a triradius in his examples. So, his comment is a bit confusing - since he should have described more explicitely that the 'falling loop' only relates to one of the two loops in his example. In Duke's book, the Falling Loop is another name for a double loop pattern. 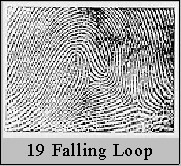 Technically, the term 'falling loop' is actually a misnomer when two loops are present; in the FBI book The Science of Fingerprints example 259 (= double loop) is similar to Ed's concept of a 'falling loop'. Fundamentally one can also visualize how the concept of a 'falling loop' represents a double loop featured with less entanglement between the two loop. Composites include patterns in which combinations of the tented arch, loop and whorl are found in the same print, also patterns where the majority of ridges are loops and a few ridges at the centre or side are whorls. These are subdivided into central pocket loops, double loops and accidentals. Double loop patterns consist of two separate loop formations, with two separate and distinct sets of staples and two deltas. They include the lateral pocket loop and twinned loop types. Only those patterns with two well-defined loops come within this category. In cases where the two sets of staples are joined but where there is a definite recurving ridge forming each staple, the pattern is classed as a double loop, the presence of an appendage on a well-defined loop does not effect the pattern. Lateral pocket and twin loops. Henry described lateral pocket loops as patterns whose core points have their exits on the same side of one of the deltas. In twin loops the ridges containing the core points have their exits on different sides. Under this heading are the relatively small number of patterns too irregular in outline to be grouped with central pocket loops and double loops. They have two or more deltas and a combination or fusion of two or more types of patterns not including the plain, radial or ulnar arch. This category also includes any freak pattern or accidental formation that does not conform to any conventional type."